The ancient region of the Indus lay on the eastern side of the Hindu Kush mountains. Although rarely defined with any specific borders, it generally followed the River Indus and its tributaries from their headwaters the north, incorporating the foothills of the Himalayas, to the Indus delta in the south. This region had witnessed the rise and fall of one of the earliest civilisations, the Indus Valley culture, between the late fourth millennium and around 1700 BC. Then it had seen the widespread Indo-Aryan migrations from west to east, and had settled into a patchwork of Indo-Aryan states or tribal regions before the arrival of the Persians. Today this region falls largely within Pakistan's borders, although throughout history it has generally been seen as part of a greater India. It seems likely that the powerful Magadha kingdom was established on the Ganges Plain by legendary Indo-Aryan kings. The second of them, Jarasandha, is mentioned in the Purana texts as a son of Brhadratha. He also appears in the Mahabharata as the 'Magadhan emperor who rules all India', although he was killed in single combat by one of three assassins from the kingdom of Kuru, who were concerned with liberating the many captive kings he held. The long line of kings who succeeded him are all mentioned in the Buddhist, Hindu, and Jain texts. By this time, other Indo-Aryan kingdoms had apparently emerged alongside Magadha, notably (but not exclusively) in the east, including Anga, Kalinga, Pundra, Sindhu, Suhma, and Vanga. The Assam region was also enjoying its first flush of kingship. This was the situation for the best part of seven hundred years. The southern part of the Indus river valley was known during the early days of the Persian empire as Hindush. Prior to that, the kingdom of Sindhu was mentioned in the Mahabharata. The name is the same, interpreted differently by different languages. The people of this early kingdom have been presumed to be 'of Indian stock', seemingly only by modern writers. In reality, this would mean that they were an Indo-Aryan folk (or at least an Indo-Aryan warrior elite ruling an earlier population) who were closely related to all of their regional neighbours both in the Indus valley and to the west of the Hindu Kush mountains. The defeat of the Medes opens the floodgates for Cyrus the Great with a wave of conquests, beginning in the west from 549 BC but focussing towards the east of the Persians from about 546 BC. Eastern Iran falls during a more drawn-out campaign between about 546-540 BC, which may be when Maka is taken (presumed to be the southern coastal strip of the Arabian Sea). Further eastern regions now fall, namely Arachosia, Aria, Bactria, Carmania, Chorasmia, Drangiana, Gandhara, Gedrosia, Hyrcania, Margiana, Parthia, Saka (at least part of the broad tribal lands of the Sakas), Sogdiana (with Ferghana), and Thatagush in the northern Indus - all added to the empire, although records for these campaigns are characteristically sparse. Conquered in the mid-sixth century BC by Cyrus the Great, the Indus region was added to the Persian empire. Before that it was populated by tribal groups or small kingdoms, all of whom - by the first millennium BC - would have been dominated by Indo-Aryan people, or at least an Indo-Aryan warrior elite which governed an indigenous group. Unlike the other eastern regions of the empire, which were ancestral homelands for the Persians, the territories of the Indus were less familiar. Even so, given the Indo-Aryan migrations through this region over the preceding millennium, there were probably no language barriers for the forces of Cyrus and few cultural differences. Although details of his conquests in the Indus are poor, he seemingly experienced few problems in uniting the various groups here under his governance. 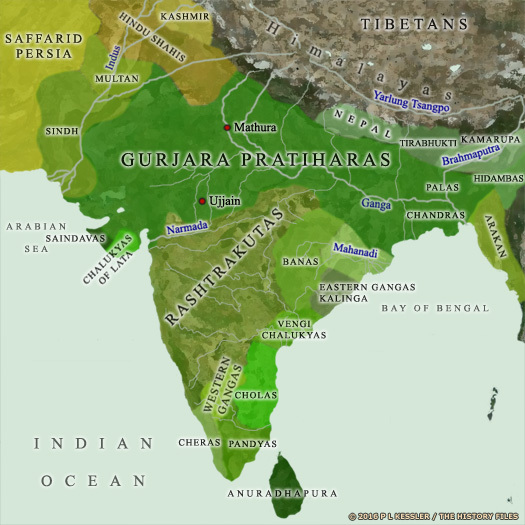 Prior to the reorganisations under Darius the Great, the southern Indus province (or Hinduš) was neighboured by the adjoining province of Thatagush (this can also be referred to as 'Northern Punjab' in some sources and Θataguš in Persian sources). Although not too much is known about Thatagush, it is clear that the River Indus formed its border with Harahuwatish (Arachosia). One of the most informative sources when attempting to reconstruct the satrapal administration of Harahuwatish and Gedrosia is that of Alexander's appointments. The capital of this main satrapy must have been Sindimana. In northern Harahuwatish, when he first encountered its large administrative complex, Alexander made important decisions about Zranka, Gedrosia, and Hindush. These regions were therefore subsumed in the Arachosian administrative complex, and this may have been the case in Persian times too. The only reliable evidence for Hindush itself is provided by historians of Alexander in their reports about the campaign and the appointments of the Macedonian king. Immediately after Darius I secures the throne he faces several rebellions, stretching from Babirush to Media and Armina to Parthawa, and Verkâna. The responses to all of these are handled well by Darius and all are crushed in turn. Another major rebellion in Mergu happens towards the end of 522 or 521 BC and that is also put down. In Harahuwatish and Thatagush, the satrap, Vivâna, faces opposition from a rival who has been appointed by the 'usurper', but Gadara, perhaps uniquely, seems to be untouched by any of these rebellions. With the emergency in Harahuwatish over, there may still be rebel elements in Thatagush. Darius conducts a campaign there, during which he also seems to secure a new satrapy by the name of Hindush. Some of this territory is already likely to have been part of the conquests of Cyrus the Great, but it is possible that Darius now extends and completes the conquest. The Ror dynasty governed Greater Sindh in north-western India from 450 BC. Satrap, with Harahuwatish & Zranka? Died. Son. Satrap, with Harahuwatish & Zranka? Killed. Replacement. Satrap, with Harahuwatish & Zranka? Son. Satrap, with Harahuwatish & Zranka? By this time, Persian control of Hindush and Thatagush seems either to have weakened or has been devolved. Three kingships are known from Alexander's campaigns in the region in 327-326 BC and must therefore exist prior to his arrival. Hindush is now governed by local potentates - Sambus, Musicanus, and Oxycarnus - and the analogy with Thatagush leads to the realistic conclusion that one of them has the rank of main satrap and is superior to the others. Presumably Sambus is the one who holds the position of main satrap, since he is 'installed' by Alexander himself, probably before the Bactrian campaign, while Alexander is in northern Arachosia trying to settle the situation in the great satrapy and in this context also designates a new satrap for India. These local rulers are shown in green text to highlight their technically subservient position to the Persian great satrap. Oxycarnus rules Porticanus in Sehwan, the latter being a popular name in Sindh, making it hard to pin down the location of this particular example. A best guess (by Nalapat) is that the territory of Oxycarnus lies between the Lakhi Mountains and Sambhus. The other two local kingdoms form its neighbours and are equally hard to place with any accuracy. King of the circar of Sehwan (Sewistan). Sambus is king of the lower Indus Valley (a version of his name is Ambiregus, which means simply 'King Ambi'). Some scholars have located this as territory between Pishin and Quetta (now in western-central Pakistan, very close to the Afghan border - Harahuwatish in the fourth century BC - and effectively midway down the River Indus rather than forming any true definition of 'Southern Indus'). Problems exist with this particular tale as retold by Classical authors and some scholars prefer a location farther south, on hills overlooking the Las Belas plain in south-eastern coastal Pakistan - very much 'Southern Indus' and also home to the 'Mountain Indians' to which Barsaentes flees in 328 BC. King of the Lower Indus Valley. Satrap? Confirmed by Alexander. Musicanus and Oxycarnus would both appear to be plains-dwelling kings who are opposed to Sambus. Following the fall of Darius III, Musicanus is quick to welcome Alexander as a friend and ally, even before the Greek king can encounter Sambus, and he is confirmed in his position. King of the circar of Sewis (Sewistan). Confirmed by Alexander. Barsaentes turns tail when Alexander appears at the border of Zranka and does not wait for him to reach Harahuwatish. Instead he takes refuge in the region of the 'Mountain Indians', a contingent of whom he had commanded at Gaugamela. These facts (probably) indicate that Barsaentes is also responsible for the province of Hindush, the home of the Mountain Indians, and therefore that it is a main satrapy of Harahuwatish. 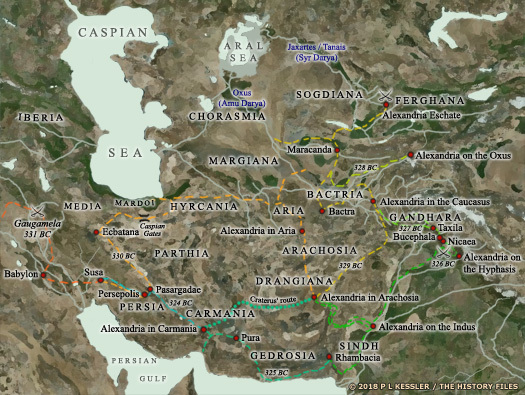 Alexander campaigns briefly there in 329 BC prior to entering Bakhtrish via the Hindu Kush. Barsaentes is eventually captured and handed over to Alexander in 327 BC by King Taxiles in the northern Indus. One of the most informative sources when attempting to reconstruct the satrapal administration of Arachosia and Gedrosia is that of Alexander's appointments. In northern Arachosia, when he first encountered its large administrative complex, Alexander made important decisions about Drangiana, Gedrosia, and Indus (both the south and also Northern Indus). These regions were therefore subsumed in the Arachosian administrative complex. The only reliable evidence for Hindush itself is provided by historians of Alexander in their reports about the campaign and the appointments of the Macedonian king. During subsequent years Alexander's many adjustments in this province are not easy to interpret, partly because some of the appointed officers lost their lives during disturbances and through illness. However, the fact that Sibyrtius was satrap of Arachosia and Gedrosia is very good evidence that the two Indus provinces were ruled or overseen from Arachosia. At the time of Alexander's campaigns in the region, the satrapy of Hindush could be divided into three units, starting with the central minor satrapy of Hindush. This was the territory of Sambus, seemingly the rightful satrap for the region at the fall of the Achaemenids. His territory was situated on the western bank of the River Indus. To the north it ended roughly in the latitude of the junction of the Indus and Chenab, and further west was the border with Arachosia, which Barsaentes crossed in his flight from Alexander. In the west the Ḥab must have marked the frontier with the district of the Oritans in Gedrosia and the main satrapy of Maka. The Kirthar Mountains were included within this territory, a fact which can explain why Sambus was referred to as the ruler of the Mountain Indians. The province's two minor satrapies included one which was defined by the Indus in the west and the Thar Desert in the east. To the north the province bordered on Θataguš (Northern Indus) at the junction of the Indus and Chenab, while the southern border is unknown. The other minor satrapy lay to the south of the first, as follows from the reports of Alexander's voyage down the Indus. Its territory was also situated between this river and the Thar Desert, and may have included the river delta too. 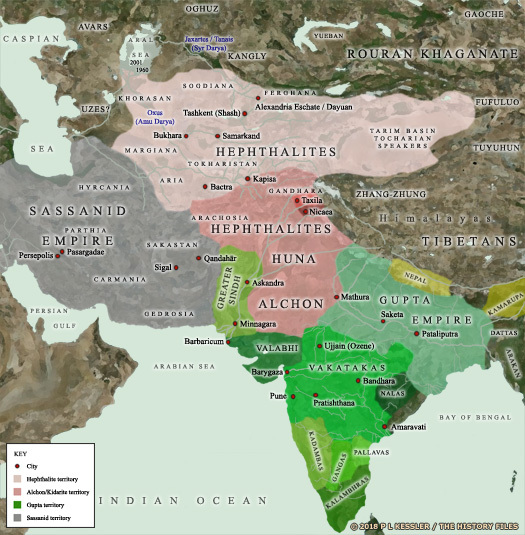 Southern Indus is now governed by local potentates - Sambus, Musicanus, and Oxycarnus - and the analogy with northern Indus leads to the realistic conclusion that one of them has the rank of main satrap and is superior to the others. Presumably Sambus is the one who holds the position of main satrap, since he is 'installed' by Alexander himself, probably before the Bactrian campaign, while Alexander is in northern Arachosia trying to settle the situation in the great satrapy and in this context also designates a new satrap for India. These local rulers are shown in green text to highlight their technically subservient position to the Persian great satrap. Oxycarnus rules Porticanus in Sehwan, the latter being a popular name in Sindh, making it hard to pin down the location of this particular example. A best guess (by Nalapat) is that the territory of Oxycarnus lies between the Lakhi Mountains and Sambhus. The other two local kingdoms form its neighbours and are equally hard to place with any accuracy. Upon Alexander's advance the region's Brahmins lead an uprising against him. They fail to coordinate this with Oxycarnus and, despite the large numbers of men under their control, both groups are defeated. Oxycarnus is captured during the storming of a second of his cities and is executed, while the captured Brahmins are sold into slavery. King of the circar of Sehwan. Resisted and was executed. With Oxycarnus removed, Sambus is next. He is king of the lower Indus Valley (a version of his name is Ambiregus, which means simply 'King Ambi'). Some scholars have located this as territory between Pishin and Quetta (now in western-central Pakistan, very close to the Afghan border - Arachosia in the fourth century BC - and effectively midway down the River Indus rather than forming any true definition of 'Southern Indus'). Problems exist with this particular tale as retold by Classical authors and some scholars prefer a location farther south, on the Las Belas plain in south-eastern coastal Pakistan - very much 'Southern Indus'. During Alexander's advance along the Indus, Sambus proceeds to hand himself over the conqueror with expressions of friendliness. However, the inhabitants of the fortified town he has recently left now reject his authority, closing the gates against Alexander. The town - Harma, or Harmatelia, Ramba, or even Rambacia - quickly falls, despite its defenders using poisoned-tipped arrows for which Alexander 'dreams' of a herbal cure. Former Persian satrap? Retained in the post. Musicanus and Oxycarnus would appear to be plains-dwelling kings who have generally been opposed to Sambus. Musicanus, king of the Sewis region along the Indus, is quick to welcome Alexander as a friend and ally, even before the Greek king can encounter Sambus, and he is confirmed in his position. King of the circar of Sewis (Sewistan). Revolted. Despite only recently having been accepted by Alexander and confirmed in his position, Musicanus revolts as soon as Alexander's back is turned. Peithon is ordered to deal which him, which he does in pretty quick time. Musicanus is brought before Alexander, along with the Brahmins who had been the leading organisers of the revolt. All are executed. Greek satrap of southern Indus. Left for Media. The Wars of the Diadochi decide how Alexander the Great's empire is carved up between his generals, but the period is very confused, especially in the east. These provinces appear to be invaded and controlled by the Antigonids for a period, with General Antigonus being responsible for the death of Eudamus of northern Indus. Following the failure of Seleucus Nicator's Seleucid reconquest of India between 305-303 BC, the Indo-Greek regions of Paropamisadae, Arachosia, Gandhara, northern Indus (Punjab), and probably also the southern Indus are ceded to the Mauryan empire as part of an alliance agreement. This territory also includes the former kingdoms of Taxila and Paurava. Subsequent relations between the Greeks and the Mauryans appear to be cordial. Seleucus even appoints Megasthenes as his ambassador to Chandragupta's court. The former Indo-Greek territories remain a Mauryan possession until the early years of the second century BC, after which they can be regained by the Greeks. In the west, Menander Soter seems to repel the invasion by Eucratides from Bactria, and pushes him back as far as Paropamisadae, thereby consolidating the rule of the Indo-Greek kings in northern India. After this, the Indo-Greek kingdom is permanently divided from Bactria. Menander is the most famous Indo-Greek king, although his relationship to the other kings is unknown (he may have been one of Demetrius II's generals). He rules from Taxila (Sirkap) and later from Sagala, a very prosperous city in northern Indus (modern Sialkot), and he rebuilds Taxila and Pushkalavati. His rule includes areas of the Panjshir and Kapisa, and extends to Indus (Punjab) with diffuse tributaries to the south and east, probably as far as Mathura. He may also occupy Sunga Saraostus (modern Saurashtra and parts of south-western Gujarat) and Sigerdis (probably modern Sindh, the Indus Delta) for a short period. He becomes a Buddhist, further promoting the always-friendly relations between the faith and the Indo-Greeks, and in India he is known as the great King Milinda who debates Buddhist doctrines with Nagasena. The death of Saka Azes II coincides with the rise of the Kushans in the west, but they remain rulers throughout the north-west frontier and in northern Indus (Punjab), Sindh, Kashmir, western Uttar Pradesh, Saurashtra, Kathiawar (Gujarat), Rajputana, Malwa (although not again in Ujjain (Ozene) until AD 78), and the north Konkan belt of Maharashtra. Following the reign of Azes, the Sakas appear to fragment to an extent, with no overall ruler (mahakshatrapa). Instead, local satraps (kshatrapas) probably hold a level of independence and continually vie for supremacy, with control of Taxila being the ultimate prize. The same Indo-Parthian ruler as Abdagases II? The Indo-Parthian ruler Abdagases II is another relatively insignificant figure, with very little numismatic evidence to point to anything other than a brief reign of little consequence. 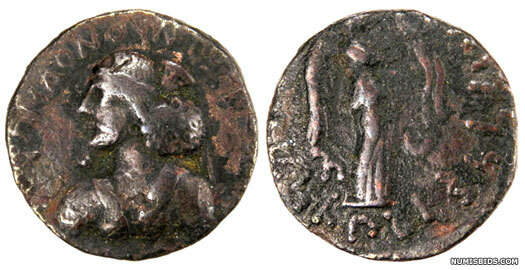 A coin found in Sindh names one Agata, possibly a corruption of his name or possibly another minor rival. The Indo-Parthians are rapidly declining now, as can be seen around AD 100 when the neighbouring Kushans capture former Indo-Greek Arachosia from them. The Rai dynasty governed Greater Sindh in north-western India from AD 416. The Brahmin dynasty governed Greater Sindh in north-western India from AD 641. Nagabhatta of Kannauj conquers territory as far as Malwa, Gwalior, and Bharuch (Gujarat). He establishes a capital at Avanti in Malwa, and checks Arab attacks which are spreading outwards from Sindh. The Habbaris governed the Abbasid province of Greater Sindh in north-western India from AD 841. Kokalla of the Northern Kalachuris defeats the Pratihara king of Kannauj, Mihira Bhoja, to establish his kingdom. In a distinguished reign, Kokalla also defeats the Kalachuri king, Sankaragana of Sarayupura, the king of Mewar, Harsharaja, and the Chahamana king, Guhaka of Sakambhari near Ajmer in Rajasthan (all three are vassals of Bhoja). Kokalla goes further to defeat some of the Turkic troops of the king of Sindh. He also plunders Vanga (in Bengal), and invades North Konkan to help his son-in-law, the Rashtrakuta king Krishna II. Mihira Bhoja I of Kannauj maintains his supremacy over the Kathiawar peninsula and Malwa, and soon establishes governance over Punjab, Oudh, and further afield. In fact all of northern India is captured by him baring Kashmir, Sindh, Bihar, the Pala kingdom in Bengal, and the Kalachuri kingdom in Jabalpur. He establishes his capital at Kannauj (now in the state of Uttar Pradesh). The Soomra succeeded the Habbari dynasty in Greater Sindh in north-western India. The Rajput Sammas succeeded the Soomra dynasty in Greater Sindh in north-western India. When the Shaibanid Turks invaded Southern Khorasan, centred around Herat, in 1507, the Timurid prince from Ferghana in Transoxiana, Babur, had already realised the hopelessness of the Timurid position there, especially with the sons of the last strong ruler, Husayn Bayqarah, fighting each other for control. Instead, he retreated south in 1506, where he had already captured Kabul (in modern Afghanistan). Shortly afterwards, he also took Ghazni (near Kandahar), displacing an unpopular Arghunid usurper in the region called Muquim. The result was that the Arghunids moved to Sindh and took over there instead. The emirate of (Greater) Sindh Greater Sindh in north-western India. Amir Hussein was appointed by the Moghul emperor, Humayun. Ruled Ghazni. Ejected by Babur. Following the loss of Ghazni, Shah Beg Arghyn makes Bukkur in Lower Sindh his capital. When the exiled Moghul emperor, Humayun, seeks aid from his subject, Hussein declines, realising that any attempt to regain control Suri-controlled Delhi will result in disaster. Rao Maldeo of Jodhpur initially thinks that an alliance with the exiled Moghul emperor, Humayun, will be a good idea. However, when Maldeo sees the reduced size of the Moghul army, he withdraws his proposal, only to make it again when Hussein of Sindh kills his father. The war against Sindh quickly bogs down, ending in stalemate. Humayan retreats to Kabul. The Turkic Takhans established themselves in Greater Sindh in north-western India and, following the death of Shah Hussein Arghun, they assumed control. Moghul Emperor Akbar completes his northern campaigns between 1586-1595 by taking Kashmir (1586), and then Sindh (1591). With the fall of Baluchistan in 1595, Akbar's authority in the north is unquestioned. By 1600 he is the undisputed ruler of almost the entire Indian subcontinent. Ranjit Singh is the one eyed son of a Sikh chieftain of Jat heritage. He unifies all of the misls and captures Lahore, which allows him to establish the Sikh kingdom of the Punjab in India. The Sikh kingdom (or empire) encompasses the Punjab, Kashmir, Himachal Pradesh, Sindh, and parts of Tibet and Afghanistan. The British in India annexe Sindh in 1844, and the Sikhs attack British divisions at Ferozepur. The First Anglo-Sikh War is triggered in 1845, and Pahar Singh (along with his son, Wazir Singh, and grandson, Bikram Singh) assists the British. He is rewarded with the title of 'raja', plus territories from the states of Nabha and Kot Kapura. Rattan Singh fights to keep Sindh free of British control. He is captured and executed in his own fort at Amarkot, on top of a high platform constructed especially to make the hanging visible for miles around and to serve as an example. Legend has it that at the gallows, his last wish is to give a twist to his magnificent moustache in a final gesture of defiance. Sindh falls to the British.